The CODAGE Anti-Spot & Lightening Concentrated Milk is a powerful skincare treatment that utilises advanced, scientific formulations with pharmaceutical principles for maximum efficacy. Rich in deeply hydrating actives (Hy2) and nourishing agents, the fluid formula features highly regenerative agents that target skin’s natural pigmentation mechanism by reducing melanin synthesis through Tc3 and Bl3, resulting in a visible reduction in dark spots and discolouration. 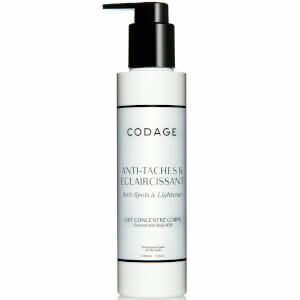 A blend of antioxidants help prevent oxidative stress and neutralise environmental aggressors. Suitable for all skin types, the body milk leaves skin feeling smooth with a more even and unified tone. Free from parabens, essential oils and phthalates. Not tested on animals. Apply to clean, dry - even exfoliated - skin, massaging concentrated body milk into skin with circular movements until it has been completely absorbed. Reapply as often as needed. Aqua (Water), Glycerin, Niacinamide, Prunus Armeniaca (Apricot) Kernel Oil, Dicaprylyl Carbonate, Butylene Glycol, C10-18 Triglycerides, Propanediol, Hydroxyethyl Acrylate/Sodium Acryloyldimethyl Taurate Copolymer, Punica Granatum Seed Oil, Erythritol, Titanium Dioxide, Glycolic Acid, Pancratium Maritimum (Sea Lily) Extract, Lactic Acid, Dictyopteris Membranacea Extract, Pisum Sativum (Pea) Extract, Bacillus Ferment, Diacetyl Boldine, Acacia Senegal Gum, Acetyl Dipeptide-1 Cetyl Ester, Plankton Extract, Trilaurine, Biosaccharide Gum-1, Homarine Hcl, Xanthan Gum, Sorbitan Isostearate, Sodium Magnesium Silicate, Sodium Cocoyl Glutamate, Methyl Methacrylate Crosspolymer, Polysorbate 60, Sucrose Dilaurate, Maltodextrin, Laureth-3, Propylene Glycol, Hydroxyethylcellulose, Citric Acid, Polymethyl Methacrylate, Sodium Levulinate, Caprylhydroxamic Acid, Polysorbate 20, Glyceryl Caprylate, Cetyl Hydroxyethylcellulose, Sodium Anisate, 1,2-Hexanediol, Dimethylmethoxy Chromanol, Sodium Hydroxide, Potassium Sorbate, Sodium Benzoate, Sodium Gluconate, Parfum (Fragrance).